Develop processing tools supporting a combined analysis of high resolution remote sensed data and modelled results for 2-way validations of coastal processes and unstructured grids. Prepare data repositories for an efficient assessment, storage and retrieval of regularly updated metocean fields. Adapt co-registration and fusion for directionally asymmetric domains to enhance the benefit of local assimilation for anisotropic or non-linear shallow water processes. 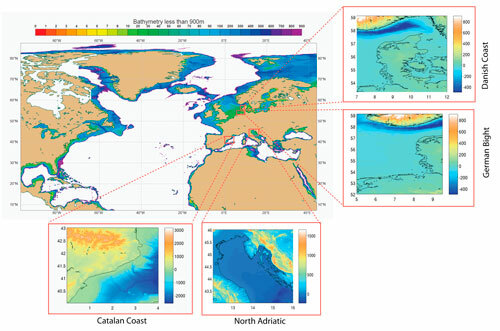 Assess the operational potential of the proposed Copernicus coastal evolution with a proof-of-concept based on performance and application value. Contribute to performance limits and good practice criteria for the combined exploitation of remote sensed measurements with numerical fields and in-situ observations within a future Coastal Service in Copernicus. Geographical distribution of CEASELESS pilot cases, including the North Atlantic/Mediterranean offshore domains and a set of coastal domains representing open/gulf coasts (Catalan/N.Adriatic) and estuary/inlet coasts (German Bight/Danish) for contrasting metocean conditions. 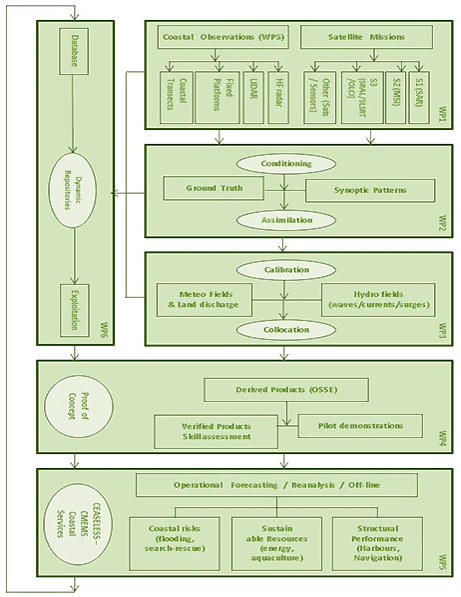 Schematization of CEASELESS modular framework, showing the transformation of research into applications so as to provide future coastal services within Copernicus. 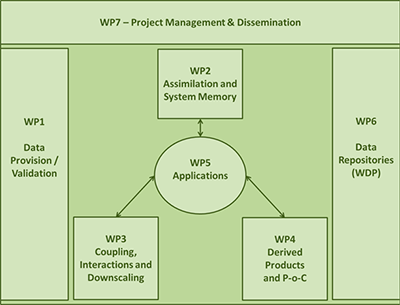 PERT diagram for CEASELESS, showing the project WPs and the main information fluxes. It will be used to organize, manage and review the work development. 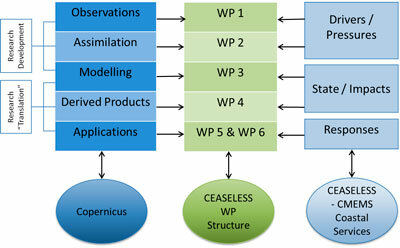 Graphical schematization of data and work fluxes in CEASELESS, from the repositories to the proposed coastal services, showing the project flow from start to end. The added value operations (assimilation for original and derived products) are also indicated.